Dances were a popular social activity for women. 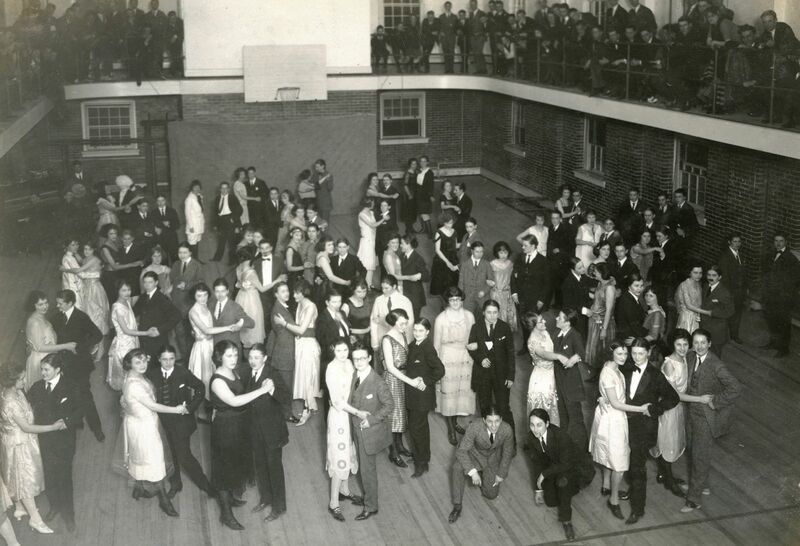 An event pointedly not for co-ed entertainment was the YWCA-sponsored “manless dance.” During the 1920s, all proceeds of the “women only” dances benefitted the YWCA. Women would dress as both men and women and dance the night away in the company of friends while male students viewed from the mezzanine above. In his final annual report to the Board of Visitors on June 10, 1919, W&M President Lyon G. Tyler described the “experiment” of admitting women as a success and hoped that the rights that “justly belong” to women would soon follow. Although the 24 women admitted in September 1918 were not the first to take classes at William & Mary, they were the first afforded the opportunity to matriculate. In the one hundred years that have passed, each class of William & Mary women has worked to embrace —and change—the campus community. Justly Belongs serves to commemorate William & Mary women and acknowledge the one hundred-year journey of making William & Mary their home. Curator: Mattie Clear '18, Summer 2018 Archives Assistant; with curatorial assistance from Carmen Bolt, Oral Historian; and Kim Sims, University Archivist. Exhibit Design: Abram Clear '21, SCRC Graphics Student Assistant; and Jennie Davy '08, Exhibits Manager. Fabrication and Installation: Mattie Clear; Jennie Davy; Jamie Fletcher and Daniil Eliseev, Undergraduate Student Assistants; and Kaitlyn Sisk, Digital Archivist.